Yesterday our family had our annual pumpkin carving day, and it was a blast as always! We carved eight pumpkins this year, and it took us about six hours of working off-and-on, taking turns as one parent kept Simon entertained, and the other carved and prepared pumpkins with Sawyer and Sutton. I bought a Pumpkin Gutter tool, and it saved a ton of time this year. We still had to scrape the bottom by hand since it didn’t work very well at that angle, but it removed the seeds and strings and thinned the walls at the same time – all in about one minute flat. As a general rule, any time you can mix power tools and pumpkins it’s going to be a hit in our house! Transferring the pumpkin patterns was definitely the most tedious process. Next year I will definitely be investing in some transfer paper because everyone was complaining about hand cramps by the time we’d transferred all eight pumpkin patterns (especially the lady who transferred five of them all by herself!). We bought two battery operated pumpkin saws at the pumpkin farm this year, and they worked fairly well. By the last two pumpkins the saws were clearly struggling, and we had to replace broken blades twice, but they still sped the process up quite a bit. Sawyer was able to use the saw by himself, and for the first time he was able to carve his own pumpkin without Mom and Dad assisting. 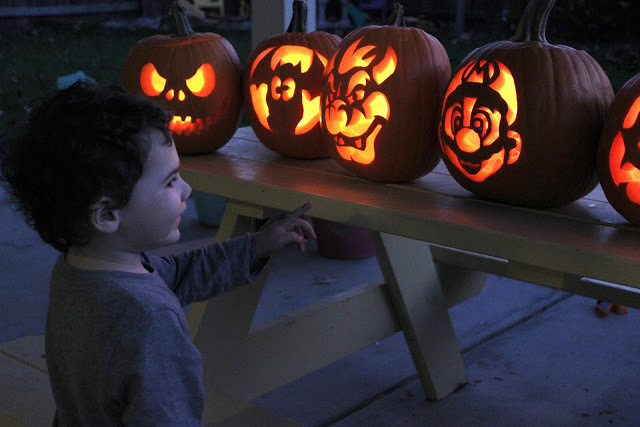 Sutton quietly grabbed my camera at one point, and took this photo of me carving the Bowser pumpkin. The whole bunch: Jack Skellington, a bat/ghost hybrid creature, Bowser, Mario, Sawyer’s smiley face, a skull with spiderweb, and Sutton’s “wink and a smile” pumpkin. We also carved a Mickey Mouse pumpkin earlier in the week, but it sadly molded already due to the warm weather we’ve been having. Simon was pretty impressed with our final creations! These guys were so proud of their work. We can’t wait to show off our pumpkins on Halloween night! I dipped the finished pumpkins in a bleach solution, so hopefully it will help preserve them until the big night. P.S. If you’re wondering what to do with all those pumpkin seeds, hop on over to Eight By Five where I’m sharing some delicious pumpkin seed recipes today! P.P.S. Congratulations to Jenalee who won last week’s iPad giveaway!